Have you decided to find love online and would like to discover the top 10 similar apps to Tinder for Android and iOS in 2018? So you’ve come to the right place at the right time. The Internet is, in fact, a gold mine with regard to dating, especially if you know where and how to search for your soul mate, or just an occasional meeting: there is not only Tinder, and above all it is not said that it is the best. That’s why today we will astonish you by talking about the best applications from this point of view. Curious to find out? You just have to continue reading. OkCupid is the first of Tinder-like apps for Android and iOS, and there’s a reason why we decided to give it priority: it’s one of the most popular and popular online dating platforms, now accessible from smartphones through the app. The operation is quite simple: you have to register, create a profile, add a photo and some information about yourself. After this, OkCupid will try to match your profile in the best way with that of other users. This is a really simple app to use: unfortunately, however, the best features are paid. Coffee Meets Bagel is certainly one of the most noteworthy innovations in the world of online dating apps. The service, in fact, has decided to give more power to women: they will receive the suggestions of the guys who could potentially like it, and these suggestions will come from you and from other guys who are looking for the soul mate online. The boys, on the other hand, will get suggestions in turn but directly from Coffee Meets Bagel, with a maximum of 21 daily matches. Finally, you should know that the staff of this site is the mediator: so it is said that your request to a certain girl will be delivered, if you have more interesting competitors for her. Happn is also one of the best app similar to Tinder for Android and iOS: it is above all because of the fact that it has a unique approach to dating. This is because Happn is a sort of social network with a geo-location function: this will allow you to be found by people and potential partners who are nearby. The interesting thing is that every time you meet a member of Happn – even if you do not realize it – you will find it later in your chronology. Once you have collected some contact, you can assign a like or forget it, just like you would on Tinder. Hinge is an online dating service that works the opposite of Tinder: while the latter is an app that focuses on the match between people completely foreign, Hinge prefers to get in touch with friends of your friends. To do so, this app uses your Facebook profile to give you suggestions that may include up to the third degree of friendship (friends of friends of your friends). Unfortunately, however, some people may not appreciate this system: many, in fact, prefer to meet strangers. Another of the best apps similar to Tinder for Android and iOS is definitely Plenty of Fish: a free app that looks a lot like Tinder, and that allows you to literally sink your hands in a “sea full of fish”. Almost all its features are free, including the ability to send as many messages as you want, and much more. We really strive to find flaws in this app: not only is completely free and full of options, but also has one of the largest communities in absolute, with over 70 million registered users. There is a mole, however: it is full of fake profiles. If you are a woman, and especially if you are tired of receiving photos and obscene messages on dating sites or apps, then Bumble is the one for you. Also in this case it is an app similar to Tinder, but with a fundamental difference: only women can start conversations, while men can only wait for this to happen. For the rest, between profile settings and messaging, Bumble is basically a photocopy of Tinder: this also applies to the potential matches found by its algorithm. If you are a man, however, know that being accepted means that you have done half the work. Skout is a kind of two in one: we speak of one of the best app similar to Tinder for Android and iOS, but also prefers to focus on friendship and not only on meetings. In practice it works on connections, allowing you to create a network of contacts and chat with them. You can even start a conversation with users from foreign countries, who use it from abroad. For the rest, the app works basically as Tinder, so with the usual combination (matching) and with the ability to click on the heart icon. Skout, however, is an app probably thought more for friendship than for dating. Grindr is one of the sacred monsters of the sector: we are talking about an online dating portal for almost 10 years, which has recently become very popular. Of course, it must also be said that it is an app for those who have a bit ‘special tastes: here it is indeed possible to find gay, bisexual and even transsexuals. If you’re straight, the advice is to give up this application: you can not specify your sexual orientation, so finding another hetero will be like looking for a needle in a haystack. 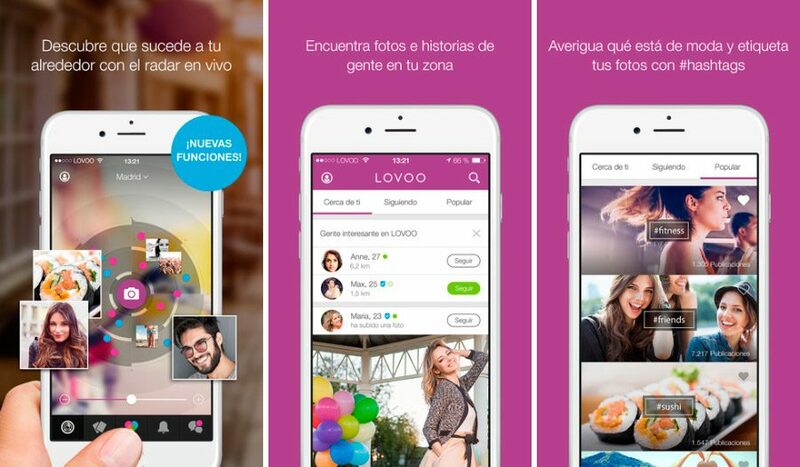 In front of Lovoo, we can not but bow down: we speak, in fact, one of the most popular online dating sites in the world, with over 26 million people registered and with many interesting features. Also in this case, little to add, since the app follows all the functions of Tinder. It should be emphasized that there is also a matching system based on common interests. We close our list of the best apps similar to Tinder for Android and iOS with Badoo:after a vertical collapse, also due to hacking, this portal is growing again. If you remember it as a sort of social network, know that today Badoo is practically just dating, even in the app version.